Draymond Green and the Warriors are favored to win a third-straight NBA Championship. Photo by Keith Allison (Wikimedia Commons) [CC License]. The NBA’s “second-season” has arrived. It took six months and 1,230 games to get here, but we finally know precisely which teams will be butting heads in the first-round of the 2019 Playoffs. Broadcasters will try to convince you that anything can happen now that the postseason is here, but that’s isn’t entirely true. We’ve crunched the numbers from every single playoff matchup from the past five years and have uncovered distinct trends and patterns that occur with shocking regularity. We’ve also examined the over/under and ATS trends for all 16 playoff teams and have included the information below so you make the most informed wagers possible. In the past five years only one eventual champion has been pushed to the limit in their first round series. That dubious distinction belongs to the 2014 San Antonio Spurs, who needed all seven games to finish off Dirk Nowitzki and the pesky Dallas Mavericks. In all fairness, the Mavs weren’t your typical seventh seed, as the team won 49 games during the regular season and finished third in the NBA in scoring at 105.2 points per game. 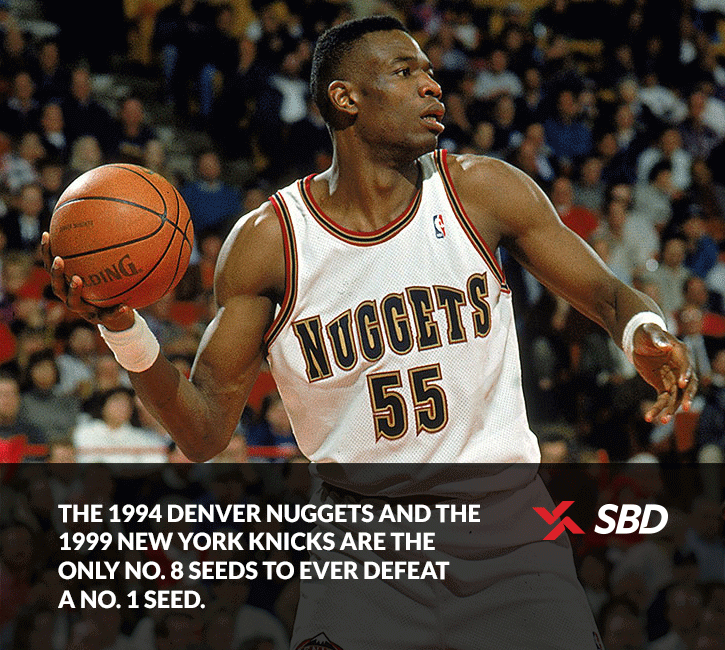 The 1994 Denver Nuggets and the 1999 New York Knicks are the only no. 8 seeds to ever defeat a no. 1 seed. However, both teams pulled off the feat when the first round was still a best-of-five format. History has taught us that the better team usually wins when a series is stretched to seven games. No. 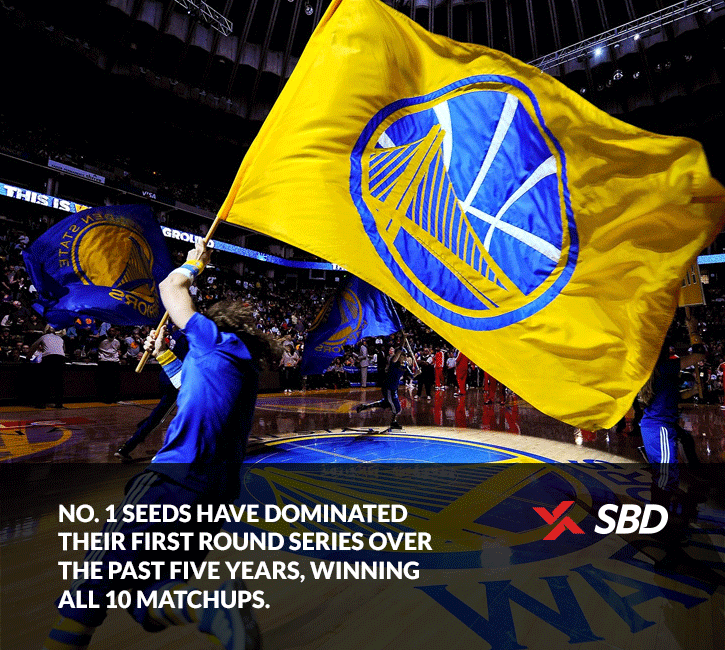 1 seeds are expected to win, but they’ve absolutely dominated their first round series over the past five years, winning all 10 matchups in the Eastern and Western Conferences. No. 2 seeds have been similarly unbeatable, going 10-for-10 during that span. The trickiest matchup to handicap has been the 4 vs 5 grouping, as the no. 4 seed has won just 30% of the time over the past five years. The difference between no. 4 and no. 5 seeds is often quite nominal, and some teams even try to tank games at the end of the season to end up with a more favorable matchup during the opening round. First round series are supposed to be a walk in the park for no. 1 and 2 seeds, but that wasn’t the case in 2018 as the Raptors were pushed to six games by the Wizards, and the undermanned Celtics escaped by the skin of their teeth in Game 7 against the Bucks. LeBron James and the Cavaliers also needed a full seven games to squeak by the upstart Pacers in their surprisingly close matchup.